On May 5, Flushing Town Hall’s Global Mashup #4: Taiwan Meets Jamaica features Stephanie Chou‘s original compositions and contemporary updates to traditional Chinese folk songs and the Caribbean stylings of Jamaican artist Owen Romeo and his group Tribal Legacy. Following individual sets, the two acts will share the stage and bring funk to your Friday with a jam session. Chou’s path to this unlikely pairing may be surprising. Before pursuing a career in music, the composer, vocalist, and saxophonist earned a degree in mathematics. However, music always had a presence in her life. She listened to a wide range of music, enjoying different genres with family than with friends. Dedication to piano and sax in her youth and a desire to perform led to a short stint playing in bars and clubs in Beijing one summer which in turn led to a decision to pursue music professionally. While Chou has primarily composed or arranged songs with vocals backed by a small ensemble, she is exploring her potential as a composer. Chou was recently awarded a 2016 Jerome Fund for New Music (JFund), a grant from the American Composers Forum, to write, record, and premiere a new piece of music with China Institute. Currently under development, Comfort Girl, is a musical exploration of comfort women, Asian victims abducted into sexual slavery by the Japanese Army in WWII. As for the upcoming performance in Flushing, she’ll be joined by erhu player and violist Andy Lin, pianist Jason Yeager, and percussionist Ronen Itzik. Her set with Owen Romeo and Tribal Legacy will be a cross-cultural exchange that draws upon the familiar and her jazz improvisation chops to creates something new, lively, and unpredictable. We interviewed Chou in early January, just before her concert at Joe’s Pub celebrating the release of her latest album, Asymptote, to get to know her as a musician with an unexpected background and engaged in cross-cultural dialogue. I was born in NYC and grew up in Irvington, a small town in Westchester County. My mother grew up in Taiwan and my father is Chinese-American. I learned Chinese before learning English. I went to Chinese school on Saturday mornings in addition to public school in Irvington. My mom spoke to me in a mix of Chinese and English at home; my dad mostly spoke in English. My grandparents, who only spoke Chinese, lived with us for extended periods of time during my childhood. We frequently visited them in Taiwan. I studied classical piano for approximately 15 years, have been playing saxophone for nearly 20 years, and have been singing for the last 6 years. I have a strong interest and background in classical piano and saxophone, and in college became interested in jazz and improvisation. ‘Asymptote’ release party at Joe’s Pub, January 14, 2017. Photo by Michael Yu. The title of your new album, Asymptote, reflects your background in mathematics. What led you to pursue that subject instead of a degree in music? I always loved both math and music, and did not consider pursuing music professionally until I was mid-way through college. By then, I had already completed a large portion of my math degree and wanted to finish it. I was studying music in college as well, and even though I didn’t complete a music degree during my undergrad years, I did enroll in a masters program for music composition (which I subsequently did not finish, because I found studying independently to be more fruitful). Now I tutor math (along with other subjects) to middle school, high school, and college students as a way to supplement my musical life. When and how did you decide to pursue a career in music? The moment when I knew I wanted to pursue music professionally actually occurred, oddly enough, during a summer I spent studying abroad in Beijing. I was taking Chinese classes during the day and playing in bars and clubs with local musicians (some ex-pats from the US, some local Beijingers) at night, for 3 months. For the first time ever, I had experienced the power of music to connect people who don’t speak the same language (I do speak Chinese; I mean more that most of the locals didn’t speak English). I always loved playing, but that experience changed my relationship to music. When I came back to NY, I started pursuing it as a career. Do either disciplines inform each other? Math certainly informs music. The influence of math in my compositions is more along the abstract end of the spectrum; some extremely rigorous composition techniques rely on mathematical concepts for their core. My use of math is more suggestive or abstract. Music informs the way I approach teaching math. I am able to relate certain concepts to different parts of music, and explain things to students in different ways. Do you keep up with math? I don’t really keep up with current trends in math as much as I sometimes wish I did, and can’t hold court with my friends who have gone on to pursue PhD’s in mathematics, but I do love to explore topics that interest me from time to time. Currently I am interested in Klein Bottles, for example. Who were your favorite musicians growing up? Anyone that would surprise us? That’s always a hard question because there are so many favorites. Growing up, I loved – Debussy, Chopin, Rachmaninoff, Simon and Garfunkel, the Carpenters, the Beatles, Carole King, Wang Chang Yuan (a Chinese zither player), Charlie Parker, Miles Davis, John Coltrane, and rock bands of the time like Incubus and Matchbox Twenty. Chinese music — traditional, folk, and Mandopop — is a foundation for the album. What kind of presence did it have in your life? Most of the source material for this album came from Chinese-related music and culture I was exposed to at a young age. I drew from poems I learned in Chinese school, tongue-twisters my grandparents taught me, recordings of guzheng pieces my mother used to play for me all the time when she was driving me to various after-school activities, folk songs I loved – things that were so ingrained in my mind as a young kid that I’ve never forgotten them. The source material was what was “most obvious” to chose for me, what I remember the most from my early years. Chinese music was always a part of what we listened to with my family. I did not really think of using its constant presence as a source of inspiration for my own compositions until maybe 2011. We mostly listened to traditional zither, folk songs, occasionally some Peking Opera with my grandparents, and Chinese school friends or my cousins would show me some Mandopop (but its presence in my life is much less than the folk songs). I actually did not know much erhu music until I met Andy [Lin] in 2009. The traditional Chinese folk songs on Aysmptote are beautifully expanded in their arrangements, but stay true to their their roots. What’s on your mind when you do these arrangements? What does it mean to combine eastern and western traditions? When I write arrangements of Chinese folk songs or take elements from my Chinese culture and expand their arrangements, my goal was to blend those existing works with my own musical ideas – to modernize them through a new perspective. The pop, classical, and jazz influences are just “my twist” on those songs. The music’s focus on combing eastern and western traditions parallels my own multi-cultural upbringing, so it was a way for me to explore my roots, and contribute something (hopefully) unique. I started exploring this idea in my music with Prime Knot and continue through now and into the future. As far as the technical elements – I mostly took existing melodies and wrote arrangements and orchestrations that were influenced by jazz/pop theory and form. The use of the erhu was treated as a feature string instrument with a specific sound – but I approached the arrangements the same way I might for any other type of music. Is the process of making a Chinese song “more western” different from making a western song “more Chinese”? Interesting question. I would have to say “No,” but I can’t say that I’ve actively tried to make many western songs “more Chinese” in the same way I did the reverse for this album. For example, if an erhu simply plays the melody of a jazz standard, is it “more Chinese”? I don’t really think so, but maybe others would. In particular, the percussive Eating Grapes is just as not if not even more playful as your rhythm and tempo mirror the drums. Can you tell us about the recording of this song? This piece was recorded during an afternoon. What you’re hearing on the recording is a mixture of improvisation and “written” material. Kenny Wollesen used both a drum set and various percussion. We planned out when certain things were going to happen and when we were going to hit certain key moments of the song, but much of it was improvised. It was a lot of fun, and by the end of the afternoon, I was definitely tongue-tied! Not all the songs are inspired by a Chinese work. “In the Forest”, “Asymptote”, and “Penelope” are deeply personal and speak to the lovelorn. Are writing these songs and performing them mentally or spiritually different from the Chinese songs? I wouldn’t say [so]. The writing process is different than the Chinese songs, though, because most of the material for the Chinese-based songs was pre-existing. With the originals, sometimes I had to write “through” a lot of material and different drafts to get to the core of what I really wanted to say with each song. There’s more freedom. How does your work contribute to the broad and varied dialogue of cultural exchange between Chinese and western cultures? My goal is to create global music that is artistically challenging, bold and fearless, and which presents a unique musical perspective. For those listeners who have some background in Chinese culture and know some of the references, I hope they feel the songs provide a fresh perspective on something they are already familiar with. For listeners for whom the source material is completely new, I hope the music provides an interesting gateway into Chinese culture. Above all, I hope listeners find the music to be intriguing, inventive, and informative. What’s needed for Chinese culture to be better understood and appreciated by others? That’s really tough! So many things, like open-mindedness, curiosity, more foundation in the history of Chinese culture, an understanding of the many different subgroups within Chinese culture – but maybe mostly, for Westerners, a relatable access point – such as food, movies, music, etc. This is a difficult question to answer in a short amount of space! Global Mashup #4: Taiwan Meets Jamaica takes place at Flushing Town Hall on May 5 at 8 PM. Dance lessons at 7 PM will get your body warmed up to move to the music. 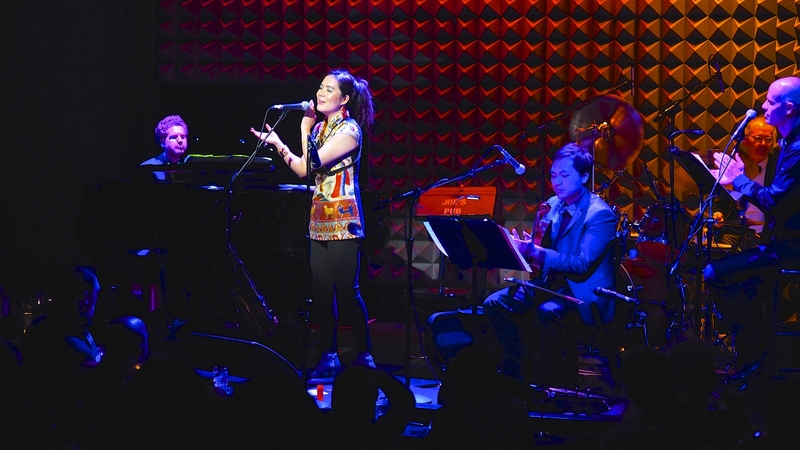 Lead photo:’ Asymptote’ release party at Joe’s Pub, January 14, 2017. Photo by Miko Fujii. The article as updated to include names of the musicians performing with her at Flushing Town Hall.